The 'Winner' Olympics And A Changing TV Picture The Winter Olympics are basically a TV show — and a successful one. Lindsey Vonn and other U.S. medal winners even helped NBC's telecast win a ratings battle with American Idol. But Frank Deford says the whole spectacle could shift to ESPN by the time we get to Sochi in 2014. 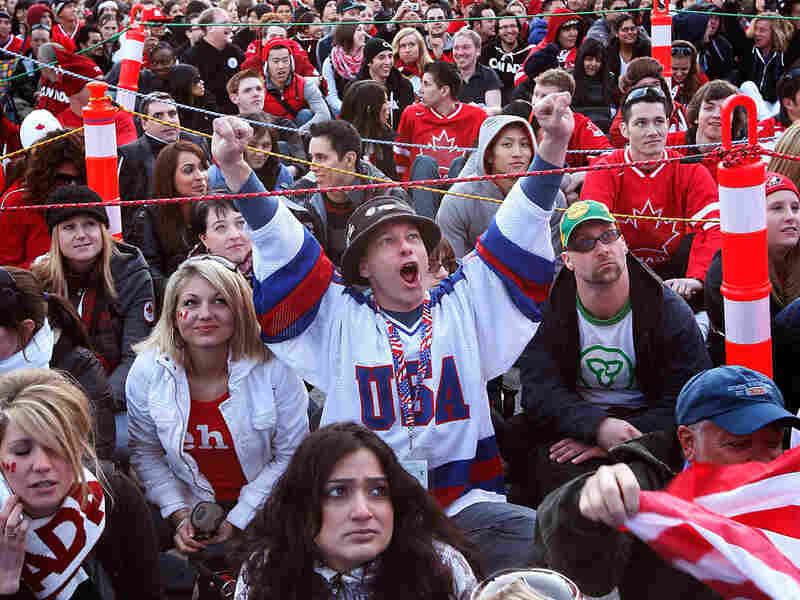 Time To Cheer: American Paul Turek watches the USA hockey game against Canada in Vancouver. The success of U.S. athletes at the 2010 Olympics have helped draw large audiences in the United States. The Winter Olympics are basically a TV show, and thus NBC, which has become the New Jersey Nets of networks, actually won the Games' most important gold medal one night last week — podiumed as we, unfortunately, actually, say now — when it whipped American Idol in the ratings. What was so revealing about this victory was that the feature attraction was Lindsey Vonn's victory in the downhill — which, of course, had happened hours beforehand and was thus, in this Internet world, already known to most viewers. Evidently, we would now rather revel in an assured triumph than suffer through a live competition with a problematic outcome. Perhaps this suggests that at this time when there is so little good news in America, when we do not enjoy the everyday success we used to rather expect, when we are so at loggerheads as a people, that there is something comforting about us coming together to watch a beautiful young woman, struggling with injury, secure in our knowledge that she will raise Old Glory on high. Every now and then, sports truly might reflect some greater meaning. Of course, like us Americans, the Winter Games have themselves changed so much. It wasn't that long ago that they bivouacked in precious little Alpine villages, where we all but expected everyone to arrive in reindeer sleighs and then yodel. Now they've moved to ordinary big cities, which just happen to have some mountains down the road apiece. Folks were troubled when the temperatures in Vancouver crept into the 50s. The 2014 Games are in Sochi, Russia. Know what the temperature there was one day last week? 73. Why, we might as well hold the indoor portion of the Games in some place convenient for TV — New York, say, or Hollywood — with the mountain stuff on location in Aspen or Crested Butte. The National Hockey League is dubious about whether the Olympics really do promote the league. So, come 2014, why truck all the way to some arena in Russia just to help the IOC sell tickets? Look, if the Olympics want hockey, well, let the mountain come to Muhammad — let the NHL boys play for their gold medal in Montreal, Toronto and Madison Square Garden. This business of jamming everything into one place just because the Greeks kept things in Olympia seems so outdated today. Whatever, these next few nights are probably the swan song for NBC's winter bacchanalia. ESPN, with all its cable riches, and its Disney network partner ABC, will undoubtedly win the contract for Sochi and Rio, too, for the summer of '16. At least maybe ESPN can get by with fewer commercials. I mean, I know, people have been complaining about too many television commercials since Howdy Doody, but these Winter Games have been ridiculous. The commercials have just taken so much spirit out of the rhythm of the visual experience. But if NBC does lose the Olympics, we lose Bob Costas as the interlocutor. ESPN hasn't anybody even near his ability to do this unique thing he does so well, night after night. You'll have no idea how good Costas is till you see somebody else try to do it.